Pet Wants Canton offers multiple blends of dog and cat food as well as healing salve, calming balm, anti-itch spray, paw wax and more. With Pet Wants, our high quality food is delivered right to your door whenever you need it ... We make it easy to get the best nutrition for your animals. When Heather Bourquin was thinking about opening her own pet food business, she thought she’d try the food with her own animals before making a decision. Now Bourquin is pleased to announce that she’s opening Pet Wants Canton. Pet Wants Canton is a mobile business and offers free, personal delivery to Stark, Tuscarawas and Summit counties as well as the surrounding areas. Pet Wants’ carefully developed proprietary pet food is slow-cooked in small batches with fresh, high-quality ingredients once per month, so every kibble is guaranteed to be fresh and packed with nutrition. Pet Wants Canton offers multiple blends of dog and cat food as well as healing salve, calming balm, anti-itch spray, paw wax and more. In addition to being made fresh monthly, Pet Wants only sources the best salmon, chicken, lamb, brown rice and other ingredients available. There’s no sugar added, no fillers and no animal by-products and Pet Wants never uses corn, wheat, soy or dyes, which makes the food great for animals with allergies. “Most people want to eat healthy and feed their pets healthy food, but it can be hard to find the time to make good food choices for both ourselves and our pets. With Pet Wants, our high quality food is delivered right to your door whenever you need it. You don’t have to plan a special trip to the pet store or pick up whatever is available at the grocery. We make it easy to get the best nutrition for your animals,” Bourquin said. “Pet Wants is the freshest kibble you can get. You can feed your pets raw or home cook for them, but if you want the convenience of a kibble without sacrificing nutritional value, you need Pet Wants. 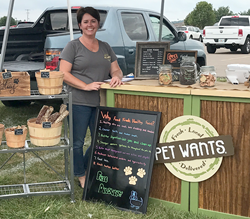 Also, since we are a locally owned and operated business, you can always talk to me about your pets and their needs so we can make sure we’re bringing you a product that will make the best impact,” she added. To learn more about Pet Wants or to get a free pet food sample, call (330)933-2301, email hbourquin(at)PetWants.com or visit http://www.PetWantsCanton.com. About Pet Wants: Pet Wants was started by Michele Hobbs out of love for her pets and frustration. Veterinarians were unable to help relieve her dog’s painful skin allergies. After doing much research, Michele discovered the national dog food brand she trusted was not fresh, not all natural, and lacked sufficient nutrition...and when pet food sits in warehouses and store shelves for months and months… it loses even more nutritional value. She was committed to developing a better solution for all dogs and cats. Their food is exclusively crafted… fresh, healthy, slow-cooked and all natural with no sugar added, no fillers and no animal by-products. They source only the best salmon, chicken, lamb, brown rice, and other ingredients. Fresh ingredients make for better food… and better health for pets. And since they never use corn, wheat, soy or dyes, the common pet health problems associated with these ingredients are no longer worries. Their fresh food is conveniently delivered to the customer within weeks of production, not months. Roughly half of Pet Wants products are sold through their store and half through their convenient, home-delivery program. You can learn more at http://www.PetWants.com.